Improve energy efficiency and provide an uninterruptible power supply to a data center during its launch phase. A 9355 Eaton UPS equipped with Eaton’s Intelligent Power Manager (IPM) software. 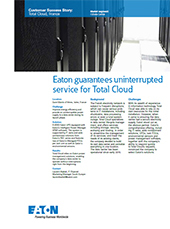 The system is supported by IT racks and aisle containment solutions from Eaton’s REC series and features two of Eaton’s Managed PDUs per rack unit as well as Eaton´s environmental sensors. The French electricity network is subject to frequent disruptions, which can cause various problems in IT installations, including shutdowns, data processing errors or even a total system outage. Total Cloud specializes in data center lifecycle management, and offers services including storage, security, archiving and hosting. In order to streamline the management of its services, and meet the needs of its existing clients, the company decided to build its own data center and centralize everything in one location.